Well, this is strange. Apparently I have 5 out of 4 upgrades for Junk Dealer. Furthermore, I cannot upgrade Flea Marketeer; when I click it nothing happens. 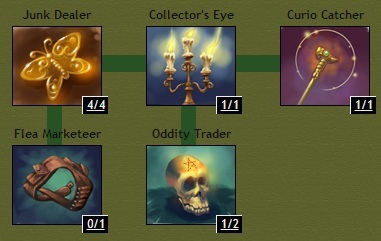 Upgrading Curio Catcher seems possible, but after the pageload the situation remains the same (skill point not spent, Curio Catcher not upgraded). That's what I call junk overflow error. To get rid of it, buy Dust of Redecisiveness, it should fix it. So that solves the problem for me, but it still is very strange. To get rid of it, buy Dust of Redecisiveness. Buy Pretty Little Liars Season 3 DVD on sale almost every day for the much savings and discounts you expect to own!